Read These Healthy Start FAQs in Waco on Child Sleep Disorders! Your child needs plenty of consistent and quality sleep as part of their early development. Interruptions in this sleep can cause severe complications for many aspects of their overall health. That’s why dentists recommend parents to not only learn about sleep disordered breathing (SDB), but read up on the most common questions on the condition. Thankfully, there’s a program designed to get them treated: Healthy Start™. In today’s post, a dentist goes over a few of these Healthy Start FAQs in Waco to help your family stay informed! Misaligned teeth is one of the leading causes of SDB. Most people would prefer to have a straighter smile if they could, largely because crowded, misaligned or rotated teeth are generally less appealing to people compared to straight teeth. But fixing a misaligned bite or crowded smile is about far more than cosmetics. Since these issues can develop in children as young as two years old, addressing orthodontic issues early can help you protect them from developing sleep disordered breathing. How Can SDB Be Treated? The Healthy Start program utilizes unique oral appliances that reposition the jaw, tongue and teeth all in one process. These appliances make it easier for them to breathe while sleeping and shift teeth from problematic positions into healthier ones. The results include a better developed airway for proper breathing, better jaw development, improved oral habits (i.e. easier brushing and flossing) and straighter teeth without the use of braces. What Are the Risks of SDB? Will SDB Self-Correct On Its Own? Unfortunately, issues like these only tend to stay the same or worsen over time. This is why early treatment is such an important step of preventing developmental issues from appearing later in life. Should I Pursue This Treatment for My Child? If recommended by a dentist, you should absolutely begin the Healthy Start program for your child. The long-term consequences carry much higher costs compared to what you would spend now on treatment. 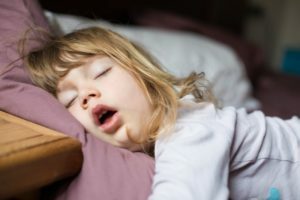 If you had the ability to prevent your child from developing sleep apnea as an adult, wouldn’t you want to stay proactive? Schedule an appointment with a dentist to learn more about Healthy Start in Waco! As a successful former engineer for many years, Dr. Nick Cobb’s background gives him a unique perspective in the dental field, including when recommending programs like Healthy Start. His office can create a custom-made sleep appliance specifically designed to solve breathing issues and promote proper tooth and jaw development for your child. To learn more about his practice or the treatment itself, you can contact him through his website. Comments Off on Read These Healthy Start FAQs in Waco on Child Sleep Disorders!